To equip attendees with an understanding of the current mobile landscape and to help them consider the impact this has on libraries, publishers and users in providing access to resources and services. The webinar will provide an overview of current developments in mobile services and resources for libraries and content providers. We will set the scene by sharing some facts and figures about the current mobile landscape and considering this in a library environment. We will conclude with a reality check to apply the ideas into a real world context and a call to action for those considering developing mobile services or mobile content. 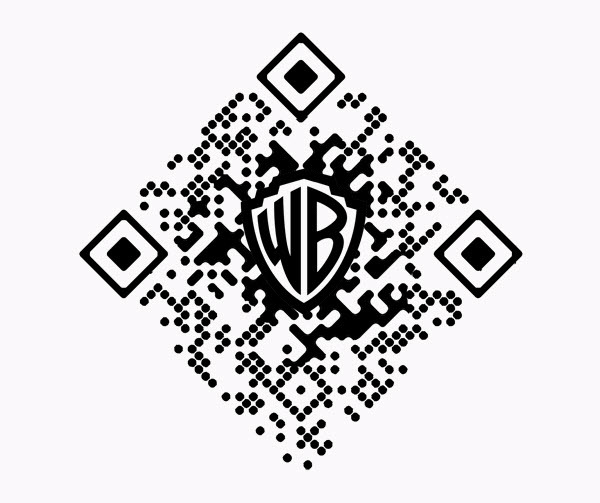 Mobile technologies provide us with an opportunity to do something new; to rethink the ways we’ve always done things. The particular affordances of mobile (its portability, functionality, personalisation) mean it enables things to be done in new ways, and for new things to emerge entirely. Hopefully, the examples and resources shared in this post, the blog and the community as a whole highlight that developing mobile services and content doesn’t need to be expensive or complex. Rather, there are a number of cheap or free services and approaches that mean there shouldn’t be any barriers to getting started with mobile library development. For more resources see the #mlibs resources widget in the right hand side of the blog (which you can subscribe to if you wish). This entry was posted in Events and tagged uksg, webinar on June 19, 2013 by Jo Alcock. One of the common barriers preventing implementation of mobile technologies is staff awareness and familiarity. A number of different methods have been used to assist in this area of skills development, and 23 things programmes have been developed to support development of mobile skills – see for example the open 23mobilethings course. 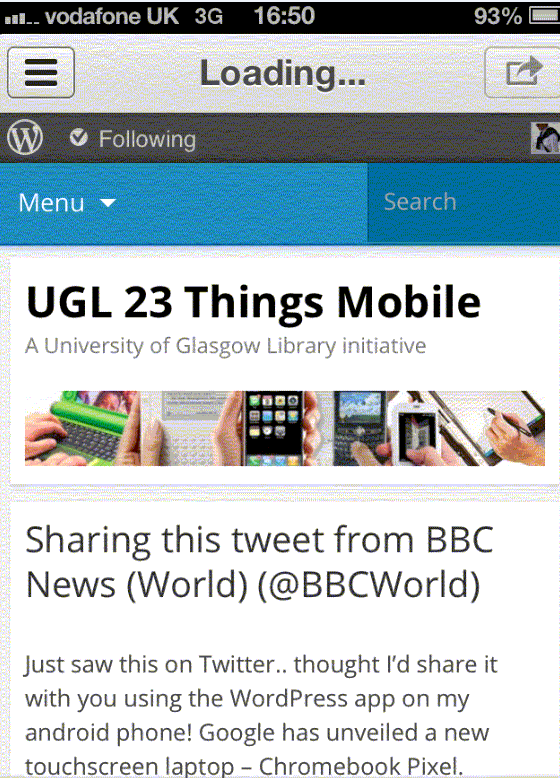 University of Glasgow have developed a 23 things style course for introducing their staff to mobile devices and technologies, and their experiences are shared in this guest blog post by Kay Munro and Karen Stevenson. Kay Munro is convenor of the University of Glasgow Library’s Mobile Technologies Group. Kay is a College Librarian providing support to the College of Social Science. 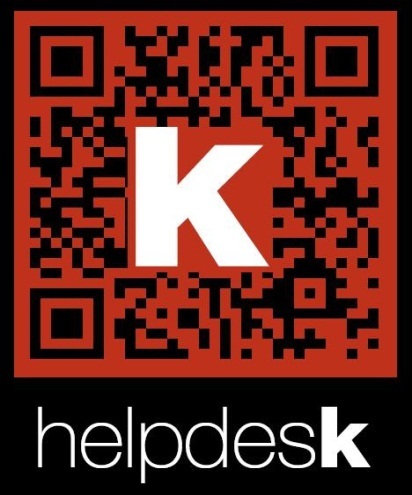 Karen Stevenson is a member of the University of Glasgow Library’s Mobile Technologies Group. 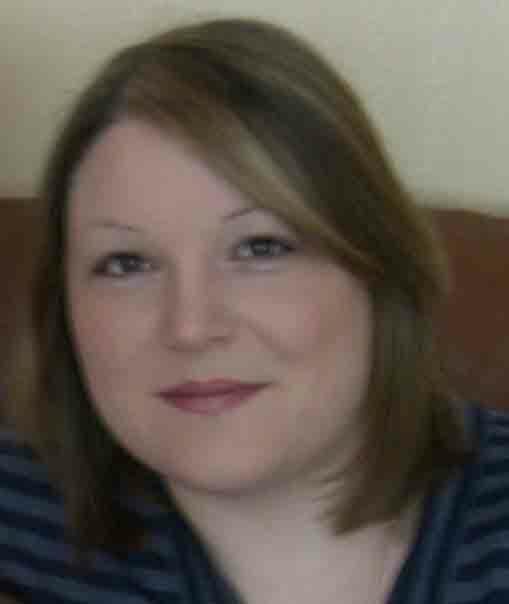 Karen is the Library Systems Manager and a member of the Digital Library Team. 23 Things Mobile is a self-directed training course, designed to introduce Library staff to mobile technology and its applications that has been developed by the University of Glasgow Library. The 23 things concept has been widely adopted in recent years and, when looking for an online training model to support a Library staff skills initiative on mobile technology, it was an obvious one to consider. However, because of the dynamic nature of the topic, we wanted to provide staff with a fun and interactive experience which incorporated opportunities to come together to try out devices, apps and activities using the wide range of devices and facilities available in the Library’s Live Lab. So a hybrid model, based on the 23 things idea, was developed. Glasgow’s 23 Things Mobile course is made up of three elements: VLE content, a private blog and group sessions in the Live Lab. The majority of the content is delivered via our VLE, Moodle, which allows us to create visually rich and interactive content. The dedicated blog hosted on WordPress allows participants to engage with each other and share their experiences and thoughts about the course content or related aspects of mobile technology. 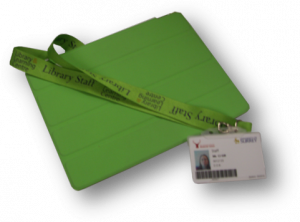 The Live Lab concept, established at an early stage in Glasgow’s mobile strategy, had been developed to provide Library staff with the opportunity to use a wide range of mobile devices in a dedicated space within the Library, or to borrow for use at conferences or at home. The Live Lab sessions for 23 Things Mobile took place half way through the course and brought participants together in small groups to try out a range of devices and a series of fun, but related, tasks which covered all aspects of the course content. A decision taken early in the process was that the focus would be on mobile technology in general and not specifically on its application to libraries. The aim was to develop skills generally to increase confidence and familiarity with all aspects of the mobile environment. The course content was created in-house, but did incorporate content from external sources, such as the websites of the major device manufacturers and software developers as well as blogs and other social media outputs from the technology and academic communities. 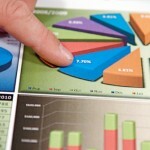 The content was a mixture of text, images, video, audio, presentations and quizzes. Using the 23 things model, the course was structured around a number of themes with several ‘things’ grouped together in each theme. The order of the main themes was determined to ensure that the course was progressive, allowing participants to build on knowledge from week to week. We also tried not to make any assumptions about the skill level of participants. The course was therefore designed to be introductory but with opportunities for discovery of more technical aspects via optional ‘Geek spots’. 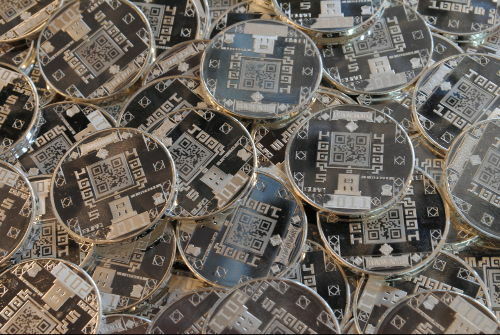 The first version of the programme was tested with a small pilot study of 23 participants. 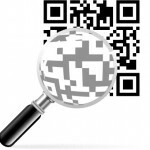 This gave us the opportunity to test both the content and the administration of the course. It ran for 10 weeks during late summer 2012. Fifteen participants (65%) completed the whole course. Of the eight participants who failed to complete the course, two only failed to complete the final week but four completed less than 50% of the course. Evidence gathered from post-pilot interviews with participants who failed to complete the course and analyses of the Moodle logs suggest that making time each week proved difficult for certain grades of staff. The reasons for this appear to be varied, but holidays, illness and the pressure of work all seemed to be contributory factors. It was clear that some individuals struggled to motivate themselves to complete the course once they had slipped behind with the weekly programme. A few participants also reported that they felt that they already knew a lot about mobile technology and/or had no interest in certain aspects of the course. Reassuringly, 100% of participants who responded to the post-pilot survey said that they would recommend the course to a colleague and in response to questions about course content, 90% indicated that it was pitched ‘just right’. The most popular element of the course was the Live Lab session, “I like the idea of getting mixed groups of people together and letting them have the space to play around”. Several respondents asked for more of this type of activity during the course, while others recommended that more support should be available during the Live Lab session. Following on from the pilot, the course was approved by Library senior management and has now become a mandatory training requirement for all Library staff. The course is currently being rolled out in a number of tranches, with 40 per tranche, to all daytime staff in the first instance. On the basis of pilot feedback, the course structure was reduced to 8 weeks plus an introductory session, which also gives participants the opportunity to meet each other. Where necessary, participants who are not in positions which allow them to manage their own working day are timetabled a 1 hour slot each week specifically for this activity. The amount of time and commitment to delivering a staff training programme of this size and complexity in a large academic library is considerable. 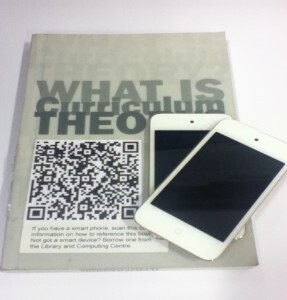 The course is currently administered by 3 members of the Library’s Digital Media Skills Group. The expectation is that, in the future, colleagues who have been through the 23 Things Mobile course will be able to contribute to its ongoing administration and provide support for current participants. Some of the pilot participants have already taken the opportunity to become ‘Geek buddies’ and are actively engaged in the 23 Things Blog and are also providing invaluable support during the Live Lab sessions. We hope that as the pool of staff completing the course increases, more ‘Geek buddies’ will emerge and will contribute not only to the administration and support for 23 Things Mobile, but will become involved with updating content. I’ve just completed the quiz and feel genuinely deflated that my 23 Things experience is over; 8 weeks have just whizzed past! Good luck to the recently enrolled newbies, I hope you enjoy as much as I have and learn lots of new things…or 23. 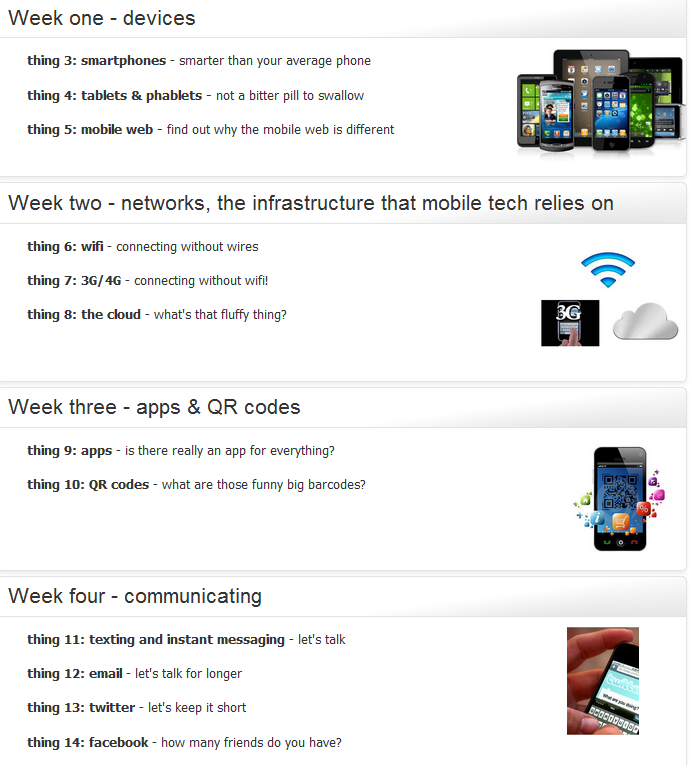 I can’t believe it is 8 weeks since we started 23 things mobile! I suppose time is really fast when you are having fun? I have learned quite a lot during the course, and I can now show off to my friends when they ask what does that mean? 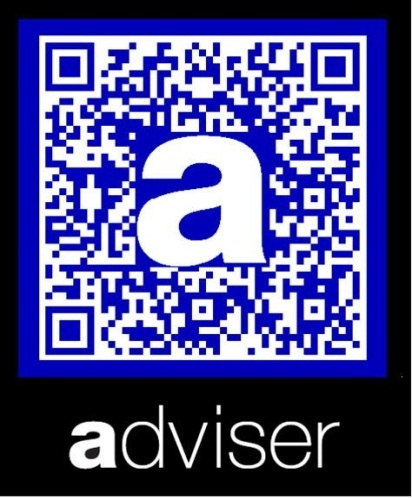 or how can you do this on your mobile? The course was well paced, extremely informative, varied, interesting, thought-provoking, and, ultimately, somewhat scary (Week 8 and the future!). But above all it was FUN, as promised at our induction! … And may I ask if former participants are still allowed to blog occasionally should the desire seize them? Access to the Moodle and blog remain open to all previous participants. This allows them to refresh their knowledge as content changes and keep updated with the Library’s mobile initiatives, and hopefully, to continue to support their colleagues as they embark on the 23 Things Mobile adventure. For the course administrators, delivering the programme to our evening and weekend staff will be the next challenge! This entry was posted in Guest blog posts and tagged kay munro, rosemary stevenson, university of glasgow on May 22, 2013 by Jo Alcock. 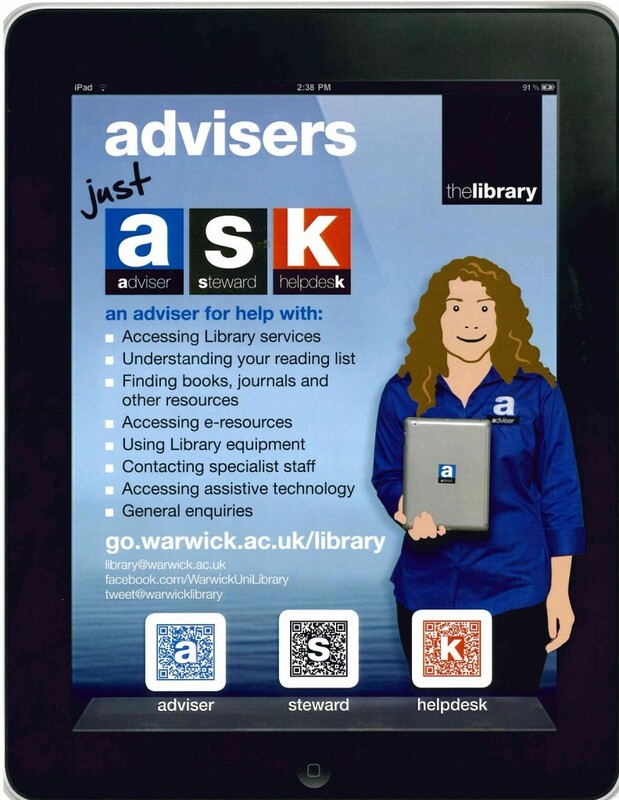 This guest blog post is written by Annmarie Lee, an Assistant Liaison Librarian – Enquiry Services for Library and Learning Resources at Birmingham City University. On a day to day basis she is part of a team that provide enquiry services at the University’s Health library and Art and Design libraries. She has participated in several strategic projects including the development of a single Help Desk within the libraries, the implementation of a library online chat service and more recently the use of mobile technologies in libraries. As part of Library and Learning Resources’ Mobile Technologies working group at Birmingham City University, a small working group was established to look at the development of the library facility on the Birmingham City University Mobile App (iBCU). 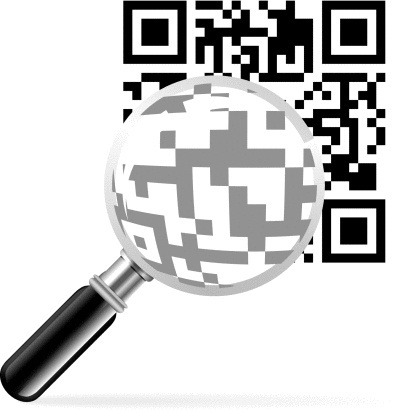 Our first task was to find out what functionality is currently being offered by libraries through mobile apps. 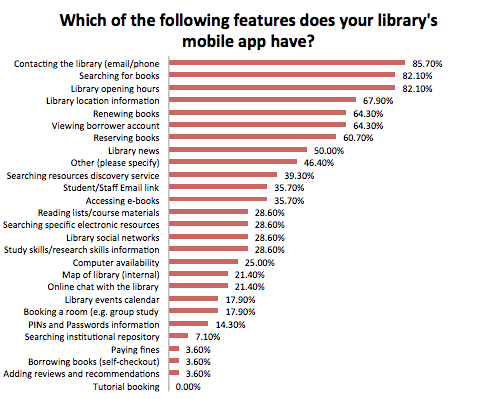 We devised a short survey asking libraries to share with us what their mobile app included. 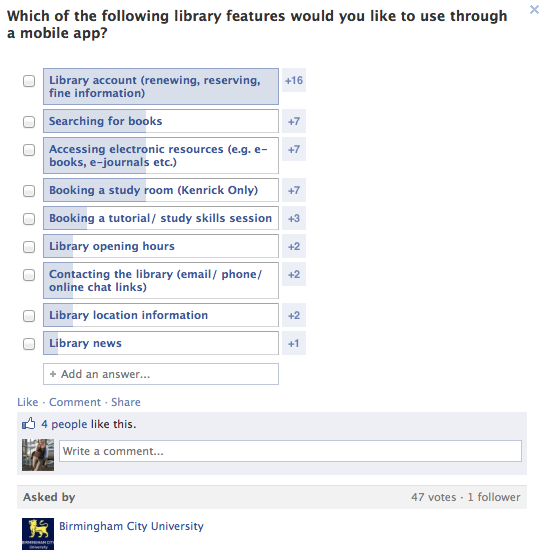 A total of 28 responses were received from both public and academic libraries both within the UK and internationally. Respondents indicated that 61% used Apple devices for their library apps, followed closely by 54% using Android devices. 82% indicated that they used a mobile web app (accessed via mobile browser). Which of the features does your library's mobile app have? Early results indicate that managing library accounts are of most interest, with searching for books, accessing electronic resources like e-books and e-journals, and booking study rooms also likely to be popular features. 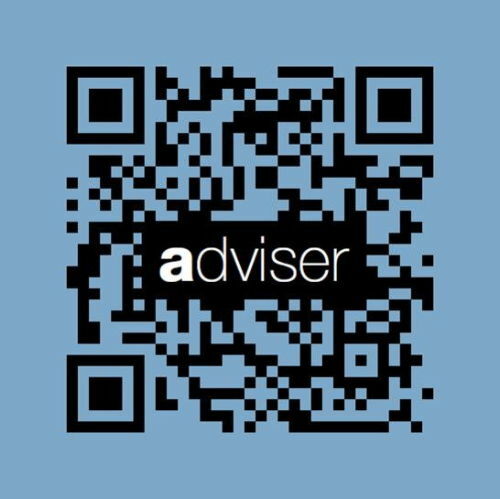 The iBCU app already has a library facility to view your account details. The next step will be to work with ICT to look at the feasibility of adding functionality to this like the ability to renew items. A separate working group has also been established to look at embedding mobile apps like that of the EBSCO database into the existing iBCU app. This entry was posted in Guest blog posts and tagged annmarie lee, bcu, mobile app, user survey on February 22, 2013 by Jo Alcock.